"Our all time favorite dish. Breaded chicken baked with Muenster cheese and mushrooms in chicken broth. Easy enough to make for the family, but special enough to make for company." Dip chicken in milk, then in breadcrumbs. 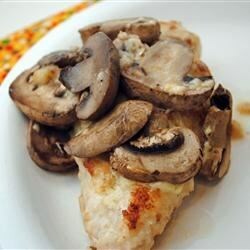 Lightly brown coated chicken in a large skillet, then arrange in a 9x13 inch baking dish. Top each chicken with a slice of cheese. Top with mushrooms, then pour broth over and around chicken. Cover dish with aluminum foil. Bake at 350 degrees F (175 degrees C) for 30 minutes; remove cover, baste with any remaining broth, and bake for another 15 to 20 minutes. This was good, but I felt it was a little bland. We LOVED this recipe!! Followed others suggestions about dipping chicken in egg instead of milk, doubling up on the cheese and sauteing the mushrooms. Was just as good the next day.